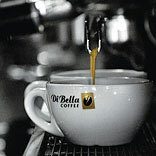 Di Bella Coffee, the Australian coffee company, has opened its doors in Mumbai to usher in blends from the world’s finest coffee growing regions. Di Bella Coffee India is at the forefront with facilities like web access, social media optimisation, email access, interactive digital menu and Tablet technology. The store displays a stylish contemporary functionality while the light and spacious design sensibilities are a mix of Italian and modern styles. Di Bella India also offers luxury teas, special cold beverages and delicious food served in the warm and friendly café’s at hi-profile locations across the country.